Use our guide to make sure your turf is growing healthily and bug-free. It is very common for small brown toadstools to appear in recently laid turf. They are of particular concern to parents of small children, who worry that they may be harmful if eaten. 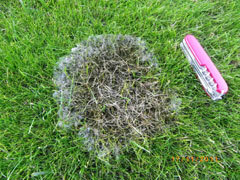 For most of its life cycle the fungi that feed on the dead material in the turf are too small to easily see. However, under certain weather conditions the fungi move into a reproductive phase and produce the small brown toadstools found in the turf. The spores (serving the same purpose as seeds) released from the toadstools fall to the ground or are carried long distances on the wind. The air is full of the microscopic spores of various fungi and they will only grow if they find suitable conditions. In the case of newlylaid turf, the spores only grow if a suitable food source remains in the turf. Once the dead material in the turf has gone, the toadstools will go as well. It is very unlikely that they will return in quantity. The most common of these toadstools is the "brown hay cap", but other species may be involved. 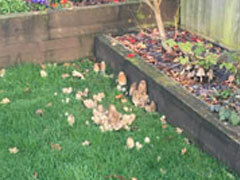 In some gardening books, the only reference to toadstools in turf is in connection with fairy rings, which can be a very serious problem on mature lawns. The small brown toadstools found in newlylaid turf are completely different from those found in fairy rings, and have no longterm consequences. If toadstools of colours other than brown are found, it is likely that they are living on buried dead wood, for example tree roots. In this case, the toadstools will be found immediately above the decaying wood. Removing the wood will prevent fungi of this type from growing. To summarise; it is very common for small brown toadstools to grow in cultivated turf in the weeks after laying from whichever grower it is obtained. They are not damaging to the turf and are a temporary problem. Red thread disease is one of the most common diseases of turf in the UK. The Latin name of the fungus that causes the disease symptoms is Laetisaria fuciformis. The disease is usually not very harmful and usually causes no permanent damage, but it can be unsightly. Irregularly shaped, pale pink areas of turf with the leaves of the grass often dying and matted together by fungal growth occur in the growing season. Often there are pink fluffy fungal growths or coral red needlelike outgrowths, which give the disease its name of red thread. The condition of the soil under the turf is very important in defending against disease attack. A well structured, freedraining soil will help to produce healthy turf. 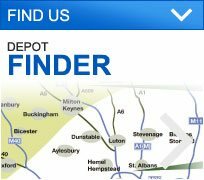 Using a preturfing fertiliser will help prevent its development on less fertile sites. 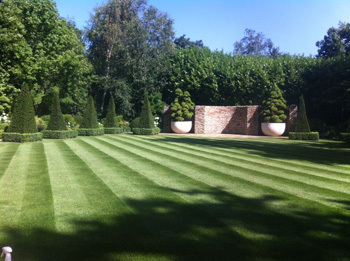 Once the turf has rooted down and established, the lawn should be fed occasionally in the normal way using a fertiliser with a high nitrogen content. There are currently no fungicides recommended for use by amateur gardeners in the UK to control red thread. 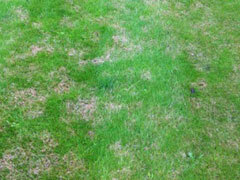 It is usually not necessary to use fungicides for the control of this disease, as it rarely kills the grass outright. The development of this disease is related to the fertility of the soil where the turf has been laid. However it is commonly found on various types of turf surface and it may occur naturally anywhere. Leatherjacket grubs are the larvae of daddy long legs or crane flies, large insects commonly seen flying in summer and autumn, often attracted to electric lights. The grubs are legless and grey/brown without a distinct head and usually grow to a maximum length of 30.4 mm. The number of leatherjackets varies from year to year but they are usually more common after an autumn when there have been more adult flies around, as in autumn 2005. In late summer, each adult female fly lays up to 300 eggs in grassy areas, where they soon hatch into leatherjackets. They stay underground over winter and cause most damage to the turf the following spring before hatching and flying away as new crane flies. They then mate and produce more eggs. When will I find them? If leatherjacket grubs are already present in newly delivered turf they may sometimes be spotted falling out of the turf if it is left on a paved area for a few hours before laying. 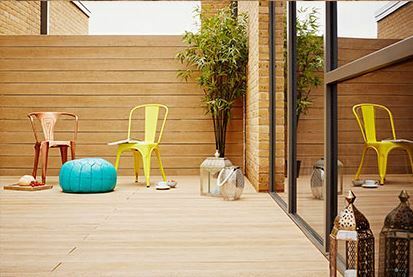 They also occur in turf after it has been laid, sometimes inhabiting the thin space between the new turf and the soil beneath, particularly if the turf bed has been overcompacted. They will not be found unless the turf is taken up to expose the roots. 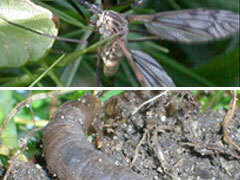 Crane flies are just as likely to choose a newly laid lawn to lay their eggs as any other established turfed area. What damage do leatherjackets do to the turf? The insect larvae feed mainly on the roots of the turf, reducing its ability to take up nutrients and thus stunting growth. Damage is also caused by animals and birds scratching up the turf in their search for grubs. Can I control them with an insecticide? Bayer's Provado Lawn Grub Killer (active ingredient imidacloprid) is now available in garden centres. It is most effective when the larvae are small and soft in the autumn. Only use insecticides if really necessary, as they can affect the health of bees and birds. Is there a biological control? "Nemasys Leatherjacket Killer" contains a parasitic nematode called Steinernema feltiae. For mail orders see www.nemasysinfo.com. It is watered onto the lawn in autumn when the larvae are small and the nematodes can enter their skin and kill the leatherjackets, provided conditions are suitable. Leatherjackets are commonly found in lawns and other turf areas. You can only legitimately complain about leatherjackets to your turf supplier if they were in the turf when it arrived, as they commonly develop from eggs which have been laid after the turf was supplied. However, most turf suppliers will advise on leatherjacket control, even though the problem is not their direct responsibility. In order to treat them effectively, it is best to treat the young soft larvae in the autumn, rather than the large, tough leatherjackets in the spring. Fusarium patch disease is the most common disease of turf in the UK. The Latin name of the fungus that causes the disease symptoms is Microdochium nivale but in the past its Latin name was Fusarium nivale, hence its common name. Irregularly shaped orange-brown areas of turf a few centimetres in diameter develop, sometimes with a white or pink fluffy fungal growth around the edge of the patch. Over a period of weeks these die back and can create areas of bare ground. These gradually recover naturally if weather and soil conditions are warm enough. However, if the disease occurs in the autumn, the conditions may not be suitable for recovery until the following spring. The disease can occur throughout the year, but is most damaging in autumn/winter because the turf is not growing fast enough to recover quickly. Whenever the weather is very still and humid and the grass stays wet for most of the day, Fusarium patches are likely to develop. Fusarium is rarely a problem in the summer but is very common at other times of year under these weather conditions. The fungus grows in the water film on the grass leaf and that is why heavy dews and still air favour its spread. Avoid damp, shady locations with still stagnant air for laying turf. In order to keep the lawn surface dry, mow regularly to prevent the leaves of the grass becoming too long. Air movement dries the lawn surface, making conditions less suitable for growth of fungal diseases. Lay turf in sites where air can flow over the surface of the lawn to dry it out. Do not feed any more than necessary; many lawns do not need feeding if laid on fertile soil.